You can easily express emotions in Telegram, a world-famous Russian messenger service, with members of the Romanov family made by the RBTH Multimedia team. Russia Beyond The Headlines presents a collection of Telegram stickers with members of the Romanov family. 12 stickers with captions to be used in Telegram messenger. All are based on photos of Nicolas II and members of his family with captions in English. If you already have Telegram messenger, you can download the stickers by following the link (or press the photo above)>>>. Also you can send stickers to friends and they can save them on their phone. If you don’t have Telegram messenger, you need to download it to a phone, tablet or computer. 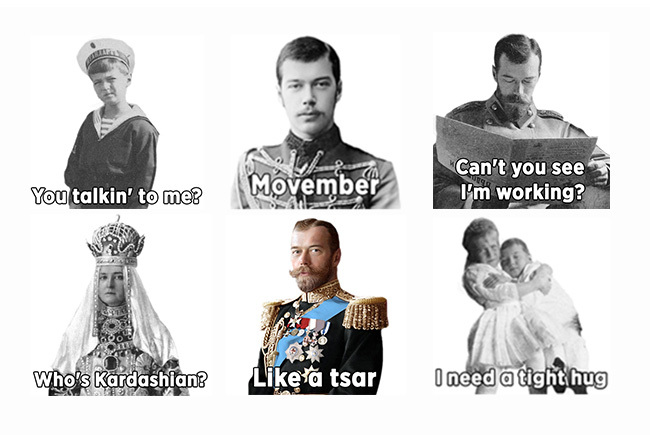 It’s a fast and fun way to communicate, especially with our Romanov stickers. Russia Beyond The Headlines is committed to putting Russia, its politics, culture and economy in the spotlight. We noticed huge reader interest in the history of the Romanov family, so we made some interesting tests, photo galleries, videos, articles, and even a long-read. We chose different photos from the archives, where members of the Russian royal family run the gamut of emotions, from jolly to downright glum. Now you can use them to communicate with friends. Don’t forget to dowload Romanov stickers by RBTH and share them on Telegram.